This cranberry salsa has a nice combination of hot and sweet flavors that go extremely well together. The addition of apples and oranges add to the light fruity flavor. Try this cranberry recipe next Thanksgiving, Christmas or anytime you feel like you need a little heat to liven things up. Place jalapenos on a cookie sheet and roast in a 450 degree oven for 8 to 10 minutes, turning once during cooking. Remove peppers to a paper bag. Seal bag and let peppers sit for 10 minutes. Once cool enough to touch, carefully peel the skin from the pepper and cut off stem end. Cut out the seeds and chop fine. Remember to wash your hands with soap and water after handling peppers. In a sauce pan add the cranberries, water and sugar. Cook over medium heat for about 5 to 6 minutes. You should hear the cranberries pop. Mash slightly and let cool 10 minutes. Add the rest of the ingredients to the sauce pan and stir well. Cool and store in the refrigerator covered. 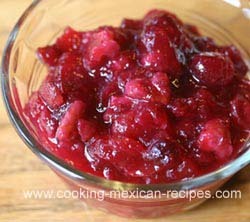 Serve cranberry salsa with tortilla chips or with turkey, chicken or even fish. Makes about 2 1/2 cups.